Japan is famous for crazy ideas, a commitment to innovation, and staying at the forefront of technology. At Menke’s, we can relate. As the Newburgh area’s top shop for foreign car repair, we love our Japanese cars, and we bring the same passion for forward thinking to automotive service that Japan brings to automotive production. Say Kon'nichiwa to Vanderburgh County’s best home for all import vehicles, and stop in at Menke’s! With over two hundred and fifty years of combined service experience, we’ve seen every kind of foreign vehicle on the road, and are especially pleased to bring our expertise to everything made by Toyota, Honda, Mitsubishi, Mazda, Nissan, Scion, Subaru, Isuzu, Datsun, Infiniti, Suzuki… and every other Japanese automotive manufacturer! Comprehensive knowledge is our claim to fame. No other shop has the breadth of expertise that our ASE certified team brings to the table. We’ve seen every car under the rising sun. It takes special equipment to handle Japanese import cars, and Menke’s has it. We work our magic on everything from struts to computer systems, and always use the factory approved parts that maintain your warranty and keep you rolling safely at peak condition. Find out why we’re the only AAA Approved Automotive Repair Shop in the area. When it comes to Japanese cars, there’s no problem big or small that we can’t handle! In 2009, Menke’s was recognized as the top shop in the country by Motor Age magazine. We beat out 165,000 other shops to earn the honor and were featured on the magazine’s cover. Add on an Angie’s Super Service award and the ASE Blue Seal of Excellence, and you might start to understand why we’re the best home for import cars in Southern Indiana. 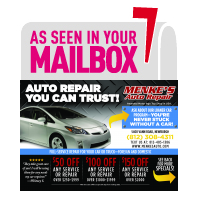 Our commitment to excellence doesn’t stop at repairs, Menke’s is also leading the way in customer service. We know it’s hard to be without a car, so we keep you rolling with free loaner vehicles. Make your repair experience a little bit more enjoyable with every day perks like free wifi, full cable television, and a waiting room so comfortable that you might not want to go home. We’re committed to going above and beyond expectations, and satisfaction is always guaranteed at Menke’s. Arigato for your patronage!